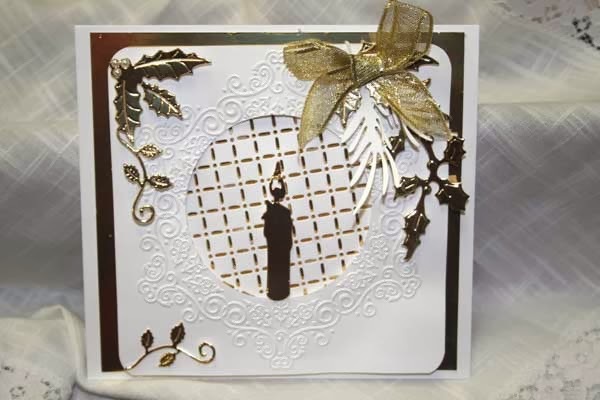 Gold and White makes such an elegant card. These kind of cards can be used for many occasions. I made this as a Christmas card. I hope you like it. As most of us seem to say, sure wish I could photograph it as pretty as it is in real life. Everything is popped up which gives it great dimension and shows the real beauty of the card. You will have until next Thursday, November 7 morning 6:00 AM EST to link your project. A winner will be chosen from a random drawing for week #44 the winner of the challenge will be announced November 8. 3. Or if you are posting to the SCS gallery, you will need to use a special code to tag your card to the challenge. This week's code is joansgardens, JG1031 and needs to be posted with the challenge. Please enter both on the same line with a comma between as I have shown. Beautiful...so elegant and pretty...the gold is gorgeous with the white!! Love all your pretty details....it's been quite a pleasure to see you creating your stunning projects each week!! I couldn't agree with Diane more. The card is awesome, rich, and adorabley clever. I am liking the idea. Can't wait to make a card of Gold and White. Absolutely gorgeous creation Joan and I agree with Judy & Diane ... it is SO WONDERFUL to see you creating again. Your style is fabulous and very inspiring! Well done my friend! Hopefully I'll be able to create something today ... I sure need more holiday cards so this will be a wonderful addition ... and so elegant! Thanks for another wonderful challenge.